John Fields, left, is the new chief of police and Craig Goodman is assistant chief of police for Stephen F. Austin State University. Their appointments were approved by SFA's Board of Regents during a meeting Tuesday. 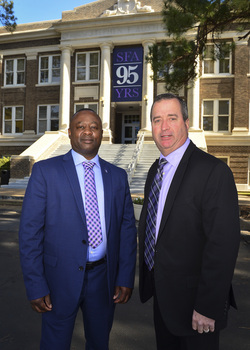 The Stephen F. Austin State University Board of Regents approved appointment of two new leaders for the University Police Department during its Tuesday meeting. John Fields will serve as chief of the SFA department. Fields served as director of public safety and chief of police at Albany State University in Albany, Georgia, since 2011, after serving as assistant chief of police and chief investigator from 2007-11. He brings a background in municipal law enforcement, having served in a variety of roles for the Dougherty County Sheriff's Office, before rising to the rank of operations captain in 2001. He holds a Bachelor of Arts in political science, a Master of Public Administration and a Master of Science in criminal justice, all from Albany State University. Fields is a decorated veteran of the U.S. Army, serving in Operation Desert Storm. "The chief of police position impacts our entire campus, and we are pleased to have found such an exceptionally qualified candidate," said Dr. Adam Peck, interim vice president for university affairs. Fields replaces Marc Cossich, who is currently serving as chief of police at the University of West Florida in Pensacola. Craig Goodman was approved as assistant chief of the SFA department. Since 2015, Goodman has served as chief of police in Brenham after working in a variety of roles at the Pasadena Police Department. He received his Bachelor of Business Administration from SFA and a Master of Science in criminal justice from the University of Houston-Downtown. In 2008, he was selected to participate in the FBI National Academy. Peck's service as interim vice president also was among the appointments approved by regents. Peck is the SFA dean and assistant vice president for student affairs. Dr. Hollie Gammel Smith, assistant dean, was approved to serve as interim dean of student affairs. Lacey Folsom, director of the Office of Student Engagement, was approved as interim assistant dean of student affairs. Faculty appointments approved during the regents meeting include Yuan He, assistant professor of elementary education; Jessica Glasscock, instructor of forestry; Timothy Nix, associate professor of computer science; Collin Timmons, lecturer of physics, engineering and astronomy; and Shannon Bowman, librarian II. In the Department of Athletics, staff appointments approved were Freddie Banks, Kevin Bleil, Wendel Davis, Kincaid Faske, Nathaniel Johnson, Malcolm Kelly, Jared May, Brian Natkin, Scott Power and Matthew Storm, assistant football coaches; Chance Chapman, assistant soccer coach; and Alex Luna, assistant volleyball coach. Regents also approved the appointments of Alisha Windham, budget analyst; Rayburn Mitchum, development officer II; Jacqueline Conde, hall director; and Benjamin Tucker, student engagement coordinator. and Tracy Wilbanks, from specialist security access to analyst identity management II. and Melissa Turner, from career coordinator to compliance specialist for Title IX compliance. The board approved the retirements of four individuals who have a combined 92 years of service to the university. Retirements include Chris Barker, associate professor of geology; Jack Ethridge, professor of accounting; David Justus, ITS compliance coordinator; and Donna Mettier, ITS programmer/analyst III.